Why do some iOS contacts have an "Arlo" icon when I never gave permission to anyone to view? So I recently found a small handful of people in my iOS contact list have an "Arlo" label where it usually says "camera" under the third icon behind "message" and "call" directly under the contact's name when I open it. I am freaking out because I've got an Arlo camera in my bedroom-very private-and this is disturbing to say the least. However, when I go to my app settings, it says I haven't granted access to anyone-but when I click on the "Arlo" icon on my phone under the contact it opens the app with full control of viewing and turning cameras on and off and basically anything else you could want to do. But other people in my contact list do not have the "Arlo" icon, it is still just the "camera" icon. Need to figure this out asap thanks. iphone 7 plus running ios 12 running version 2.6.1 of Arlo app. Re: Why do some iOS contacts have an "Arlo" icon when I never gave permission to anyone to view? This is an iOS feature that prioritizes video call capable applications for contacts (apps like Skype, Facetime, etc. appear here) as you can see on the screenshot. iOS prioritizes the app displayed based on frequency of use and eligibility. For example, a contact with an iPhone might have Facetime displayed here if you regularly use Facetime with that contact. The last app used will be shown here. If you tap and hold the icon, you can select another app. Rest assured this is NOT sharing Arlo cameras or any Arlo information with contacts in your contacts list. The update yesterday broke all usability. The new UI is terrible. Let us roll back. The last version was perfect. I noticed the same. A bit concerning actually! Facetime has Arlo as text under the icon. name in the contact list Arlo is stated. Android doesn't have the issue, BTW. I'm fairly certain it's the Arlo app. 2.6.1 was updated/released on 10/23/18. The silence from NetGear is par for the course. Could you provide a screenshot where some iOS contacts have an Arlo icon so I can take a look? FYI: In iOS, the contacts all have a "video" icon, that is grayed out (at least on mine) for a second or two. Random contacts, this icon will then turn into a blue Arlo icon. It seems that if the contact is an iPhone user, they show "normal" (video icon). If the contact is an Android user, then they show as "Arlo". Arlo is under a few of my contact names. Does this mean they have access to my cameras? If I hit the icon it pulls up my cameras. Doesn’t say I’ve granted access to anyone. I am very worried! I changed my password but can they access still? Thanks for providing that screenshot. Try to update to the latest iOS version (iOS 12.1) to see if the "Arlo" text goes away. I've already updated, I updated to 12.1 right after I noticed this issue. It is still going on. Taking screenshot now. This seems like a SERIOUS security flaw. Please fix ASAP. Oh no! This is seriously bad. Wow. Just checked a friend who also has an Arlo system. I've never given her (or anyone else) access to my arlo cameras. This is bad!!!!!! NOW a security flaw????? GIVE ME BACK 2.5.5. same!!! This is not good! And no update from Arlo folks? Seriously, this takes all of 2 minutes to duplicate. Do the Arlo programmers not have iPhones? you have given her access to anything..
Or did she "only" have the Arlo icon.. Problem with contacts showing Arlo beside camera icon. You can choose other options on the camera icon by holding on the "video" icon and you will see the list as the screenshot provides on here. 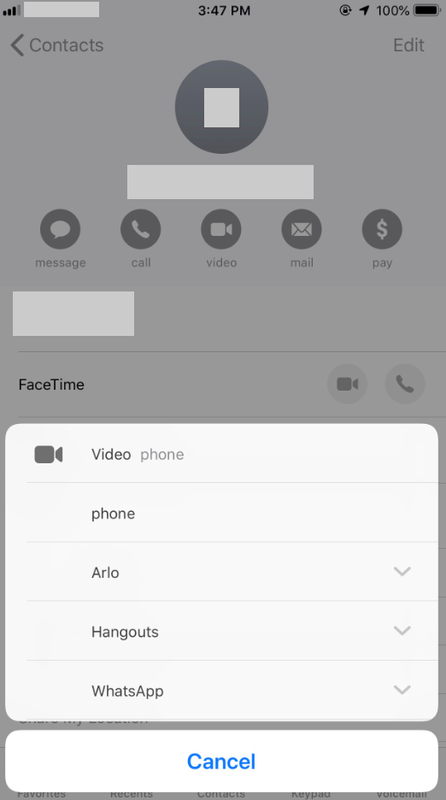 Noticed that in my Apple contacts app where I only have work or home phone entries, the video "button" is connected to the Arlo app. Arlo app v2.7.4. This happens on both iPhone and iPad. If I have a mobile phone number listed this button shows "Facetime"
Can confirm that the video icon in some of my contacts says arlo. Seems to occur on contacts that are not recognised with an Apple ID. This is on iPhone 5s with iOS 12.1.2 and App v2.7.4. Just updated partners iPhone 5s using iOS 12.1 and the issue does not appear. I just did the upgrade on my iPhone 7 to 12.1.4 and still have the same issue. I agreee with @Andberg1, the solution that was given does not work. If i go through the Arlo app i have to put in a password. If i click on the arlo icon on one of my contadts it takes me straight to my arlo without a password. This is a security issue. Please give a soulution that really works. This is unacceptable.